Third-party guarantees at auction—the art market’s hybrid of a risk hedge and a speculative gamble—are on track to hit an all-time high of around $2.5bn in 2018. On the face of it, guarantees offer a high level of certainty: the auction house secures a consignment and the seller receives a minimum price, whatever the outcome of the sale. But after the 2008 financial crisis, when sales tumbled and in-house guarantees forced auction houses to pay out large sums to consignors, they all but disappeared between 2008 and 2010. Since then, auction houses have increasingly sought to offset this risk to third-party guarantors—individuals or consortiums that often have vested interests. Such deals are now the norm for high-value Impressionist, Modern and contemporary works. But experts warn that third-party guarantees, if misused, may precipitate a crisis. “Guarantees have the potential to be the next big art-market scandal, if they are not carefully managed,” says Harry Smith, the executive chairman and managing director of the London-based art advisory firm Gurr Johns. “We seem to have one every 20 years, so maybe we’re due for another. And most crises come out of conflicts of interest.” Smith believes that third-party guarantees should come from a financial source without a “vested interest in the art market”, rather than being “passed around between a small club of guarantors, many of them with a direct interest”. The members of this club, he adds, are “often an auction house’s prime clients”, so the auction house is effectively negotiating a deal between two clients. Guarantees increase liquidity by tempting people to buy and sell works when they do not need to, but they are also increasingly being used as a speculative, potentially lucrative financial mechanism. In the London sales during October’s Frieze week alone, the overall value of guarantees increased by 50% on last year, rising from an estimated £44.8m (from 32 lots) to £66.6m (49 lots), according to the analysis firm ArtTactic. 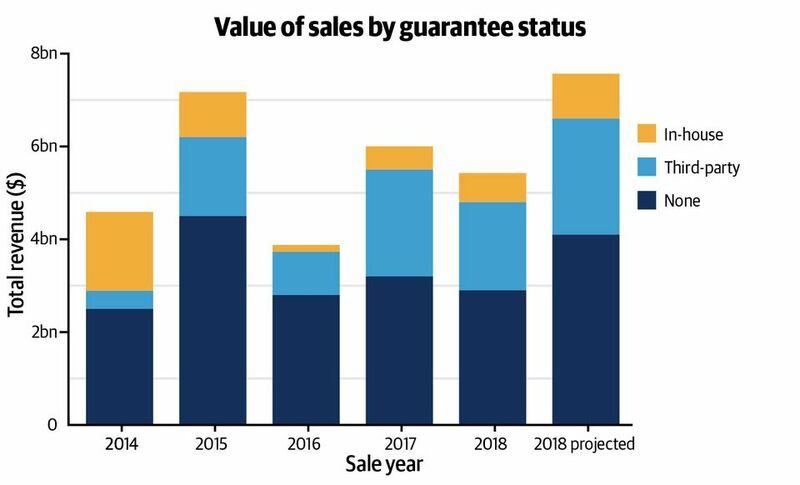 Projections from one guarantor’s in-house analysis team estimate that auction sales worth $3.47bn worldwide in 2018 will have been covered by a guarantee, $2.5bn of those offset to a third party. Even before the financial crisis highlighted the risk of guarantees, Bonhams’ then-chairman Robert Brooks issued a public statement opposing guarantees in November 2007. “The minute an auction house moves away from simply being an intermediary between buyers and sellers and takes on the role of financier, it starts to change its core character as well as the relationship between the seller, his agent and the buyer,” he said. Brooks went as far as to say that the rising use of guarantees by some auction houses “ultimately erodes the credibility of the industry and thus its stability”. Bonhams has since changed its tune, and began to issue guarantees even before its acquisition by the private equity group Epiris in September. Others believe that guarantees “distort the market and inflate prices”, says Rebecca Foden, a lawyer at the London firm Boodle Hatfield. Since third-party guarantors know the amounts and terms of the bids they have pledged, they are arguably in a better position than rival bidders, Foden says, which creates an “uneven playing field”. Becky Shaw, another lawyer at Boodle Hatfield, says that, although a third-party independent broker is an “appealing idea”, it is perhaps unlikely until there is demand for it by guarantors, or unless guarantees become subject to regulation. Guarantees have become increasingly sophisticated. “Some of it is so convoluted that I have a hard time understanding the basic elements because there are so many variations of the guarantee,” Schachter says. These guarantees cannot be seen as formulaic because they relate to the motivations of buyers and sellers, and to market conditions, says Tom Mayou of the London-based advisory firm Beaumont Nathan. Adding to the confusion is the fact that the terms “irrevocable bid” (used by Sotheby’s) and “third-party guarantee” (Christie’s) are essentially the same thing, but are used interchangeably. Schachter, who also guarantees works, says that there are “only a handful of people who guarantee works at $20m to $30m or more”. The Mugrabi and the Nahmad families are reportedly among them. 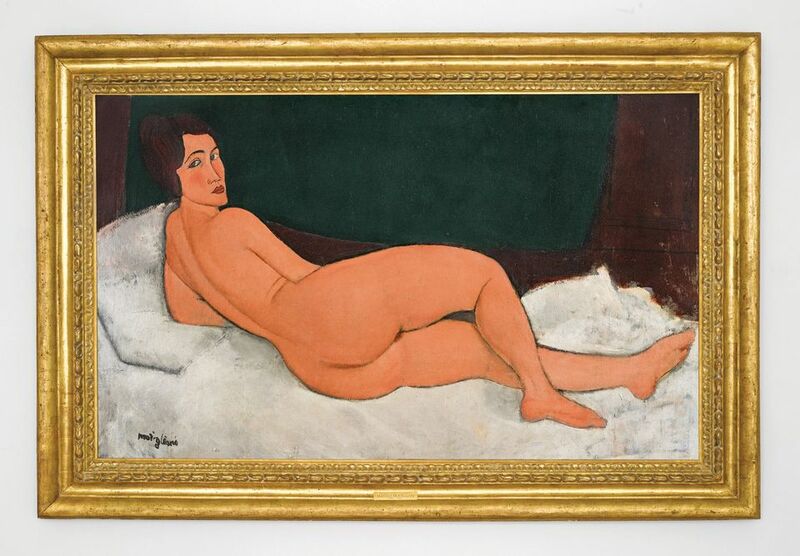 It was the Nahmad family who apparently gave the highest ever third-party guarantee, at $150m, for Modigliani’s Nu couché (sur le côté gauche) (1917), which sold at Sotheby’s New York for $157.2m in May. So, as Schachter says, you have to know the market “because you’re up against the Mugrabis and the Nahmads… you can’t come in there foolhardy and think you’re going to walk away with a fat profit”. Attracted by reports of high earnings, new third-party guarantors—many from financial backgrounds—are coming into the market, trading guarantees like futures. Speaking on ArtTactic’s podcast in September, Asher Edelman, the founding member and chief executive of the art-lending company Artemus, said that being a guarantor “is the hedge-funders’ new Ferrari”, and that he sees a “naïve crowd” of guarantors “doing pretty dumb transactions… and they’re gonna get stuck with them”. Doug Woodham, the former president of Christie’s for the Americas, also warns of the pitfalls of being a novice first part guarantor here. Yet Adam Chinn, the chief operating officer at Sotheby’s, disagrees that guarantees are conflicting. “You may make the argument that there’s an inequality of information [between bidders], but I don’t think there’s a conflict of interest,” he says. Collectors today are more financially sophisticated, Chinn says, so “if I [the collector] want to buy object A, it makes sense for me to back object A, because if I don’t get it, I get paid, and if I do get it, I wanted to buy object A anyway”. Chinn believes that, in this way, guarantees have shifted from an almost wholesale market to being retail. In the New York sales in May, around 65% of guarantors at Sotheby’s were private collectors (40% were first-timers), according to Chinn, while in November 2017, that proportion was 75%. Last year, 70% of lots backed by a third party sold above their irrevocable bid, so “you’ve got around a one-in-three chance of having to buy the property and around a two-in-three chance of getting paid”, Chinn says. Auction houses put the onus on guarantors to disclose to their clients that they have a financial interest in a lot. But it is unclear whether this always happens, particularly when last-minute saleroom announcements make it impossible for bidders to question their advisers, says Doug Woodham, the managing partner of Art Fiduciary Advisors and the former president of Christie’s for the Americas. “For all they know, the person they asked to bid on their behalf may now have a financial interest in that very lot,” he says. Woodham suggests that collectors have formal agreements with their advisers to prevent this. “But unfortunately, there is no way for collectors to independently confirm their advisers’ actions because the identities of third-party guarantors are not disclosed by auction houses,” he says. Pi-Ex’s guarantee product is yet to be fully launched for investors, and with so much power held in a small core of the market, it remains to be seen whether it will work in practice. and interesting has already happened”. Although it is currently dominant, the auction market for post-war and contemporary art is only around 20 years old. Only when those with vested interests in artists who regularly appear at auction with third-party guarantees (such as Basquiat, Warhol and Richter) retire or die, or when tastes inevitably change, will these multi-million prices be revealed as being built on firm foundations—or on stilts. Guarantees ensure that a work is pre-sold at a minimum amount, either backed by the auction house itself (house guarantee) or by a third party, who receives some of the upside should the work sell for more (typically 20%-30% of the overage above the guarantee, although this can be as low as 10% or as high as 50%). The more risk a third party takes on, the higher the potential reward.